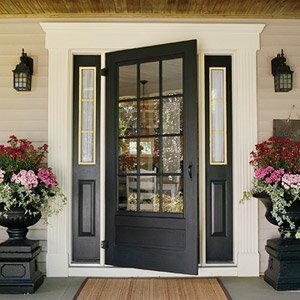 Our front doors are more than a point of passage. It is an introduction, a prelude; and it conveys protection, security and warmth. It reveals the very soul of our home and as eyes are the windows into our souls; the front door of our homes is the window into our lives. As we pass through its threshold, we may not realize how the reaction we have to its color will linger with us beyond our departure. 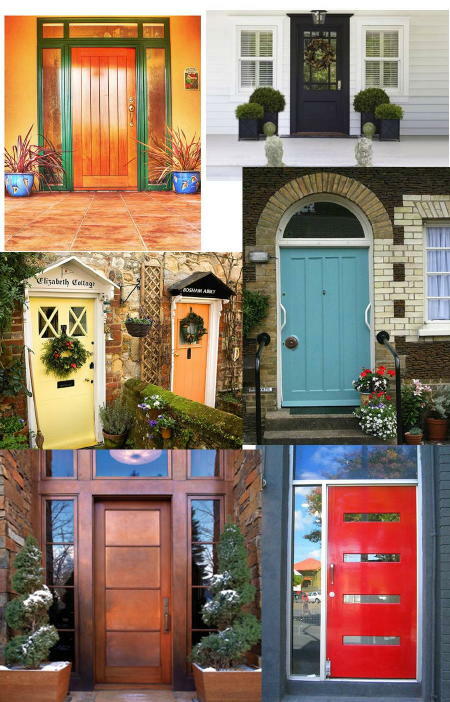 Many cultures associate complex meanings to the colors we choose for our home, and especially the color of our front door. 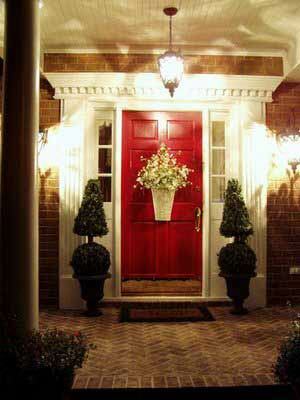 In Feng Shui, a red front door means “welcome.” and symbolizes good luck. In early American tradition, it meant a safe haven and if a home had a red front door, tired travelers who might be traveling by horse and buggy would know the home was a place where they would be welcomed to stop and spend the night or rest. In Scotland you painted your door red when you have paid off your mortgage. This heavenly color reminds us of water and blue skies and it brings calm and peace to our lives. In turn, bringing feelings of tranquility to our guests and family who enter through a blue door into our homes. There are many hues of blue from light, to bluish-green to deep indigo blue; blue is also thought to bring lots of positive energy into a space. It is said that Leonardo da Vinci meditated in a purple-colored light to improve its effectiveness. Purple is associated with wealth, nobility, stature, religion, piety and magic. It is a mix of soothing, calm blues with boisterous, energetic reds and conveys wealth and extravagance. It is the color of kings and high honor, such as the purple heart awarded American soldiers wounded or killed in war. 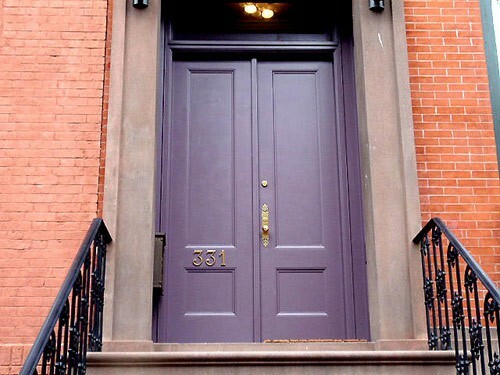 In Feng Shui, it is the color to face any direction; and a purple front door tells you world that you are open-minded and versatile to life’s possibilities. You think out of the box. Yellow is a color that evokes mental clarity, perception, understanding, wisdom, confidence, curiosity, humor and merriment. Orange is often called the “social” color, as it creates the energy to promote lively conversations and good times in your home. In the winter especially, it reminds us of summertime dreams, as well as resembles the cheerful flickering of deep and vibrant color of a warm and welcoming log fire. H.G. Wells wrote of a mystical green door in his short story, “The Door in the Wall.” The door opens into a garden of wonder and mythical creatures, giving a young boy his first glimpse of happiness in life. 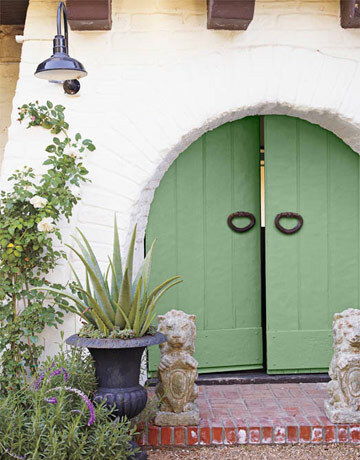 The term, “beyond the green door,” refers to an otherwise plain establishment where people are carefree and enjoy life. It symbolizes life, growth and safety, and its calming effect reduces stress and headaches. and other minor medical issues. And just like any other room in the house, the accessories of our front door are the finishing touches we place on our entry: door hardware, house numbers, door knockers, door bells, mailboxes, doormats, lighting and plants. 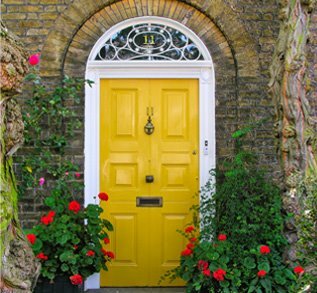 Regardless of the color of your door, the front door is the entry point where energy, abundance and opportunities may find us. That is a big responsibility to hang on a front door, and on ourselves to pick the right color to reflect our personal style and the personality of our home! Have fun and be brave! Thanks for this information. 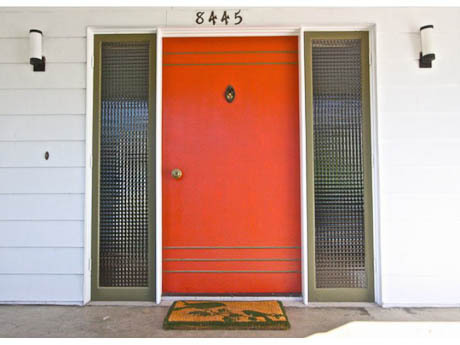 Will let you know – what color we decide to paint our front door.